Incised “Janet Grey”, Janet Grey Studios” and “Janet Grey Australia” to unglazed base. Small mould formed steep sided bowl with mainly marine ornamented handles angled down the outside. Harlequin interiors with plain gloss glazed exteriors. John Barnard Knight was born in Warracknabeal, Victoria in 1910. He was active from the early 1930s to the late 1970s. During most of this time, he taught pottery at what is now the Royal Melbourne Institute of Technology (RMIT). 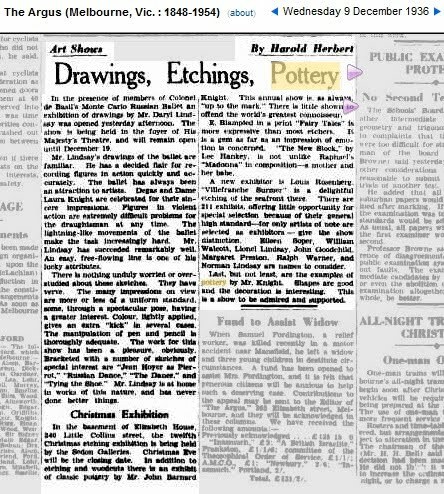 Prior to this, he and Klytie Pate had worked at Hoffman following their introduction of “Melrose” ware in 1930. They both then went on to teach at RMIT. She left after ten years while he continued on until the mid 1970s. He was a man of firm opinion. 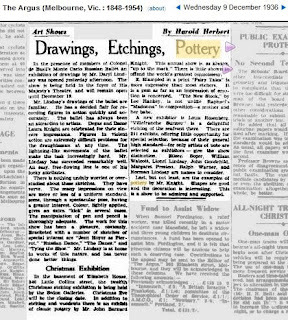 An example of the can be found in “ACROSS THE DITCH: Australian Ceramics in the Post War Period; It was at the Royal Melbourne Institute of Technology that Peter Rushforth, who had spent some years as a prisoner of the Japanese, was introduced to Leach's book (A Potter's Book ) by the ceramics teacher Jack Knight. As a firm believer in earthenware, Knight found this interest in stoneware and oriental ceramics difficult to comprehend; he sat outside in the sun reading a newspaper while Hamada demonstrated at RMIT in the 1960s, saying that they were 'always talking about stoneware ... can't understand them.” He also had a workshop in Malvern, a south-eastern suburb of Melbourne where he sold his work under several pseudonyms, one of these being "Janet Grey". I do not know how he arrived at the name, but Dr Janet Grey was responsible for the now defunct milk for school children program in Victoria. John died in Melbourne, Victoria in 1993.